Let's talk about your Thanksgiving table. Most people do not know how to take their table to the next level. There are seven layers to every table. 1. Start with your table linens. I am setting up two 6 feet tables end to end. For my table linens I am using two unused paint tarps. The texture and color are perfect. Trust me, the table will be layered with enough that they will make a perfect backdrop. 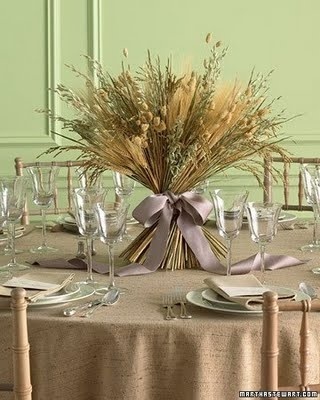 Napkins will be in a natural color to compliment the tablecloths. 2. Next we layer the dishes. I am using natural Pottery Barn chargers, an ivory charger, a dinner plate and an accent plate. Layering dishes make for interest at each place setting. If you mix and match plates, they can add additional color to the table. If you only have white glasses, I have a trick for adding color. Lay the napkin under your accent plate to give the white plates a little color. This is also a good trick if you have a small table that is a little tight. 3. Glasses provide the bling to your table. I typically set a water and a wine glass, even for the children. They will get sparkling cider. But the table looks so much more finished with pretty glasses. Do you have enough glasses for everyone? 4. Flatware is another place where you can add some bling. As you know, I have antique flatware that I found at yard sales. It is silver and looks gorgeous on the table. I use the flatware for my everyday flatware but I give it a quick silver polish. Now, how to set a more formal table. If you are going to serve salad or soup, add an additional fork or spoon for your guests. Lay an additional fork horizontally above the plate for dessert. You can mix and match your flatware if you do not have enough, but setting flatware is an important step to make your table look finished. 5. Now your table is set for guests. It is time to gild the lily. Accent pieces can make your table spectacular. Adding place card holders help guide your guests to the best dinner experience. Put some thought into who sits with whom. Dinner is an experience that everyone should enjoy. I use little salt cellars at each place. Are you going to put a favor on each guests place? 6. Next, we talk centerpieces. Flowers or natural items on the table. I am using natural accents, branches, pine cones, pheasant feathers and acorns. 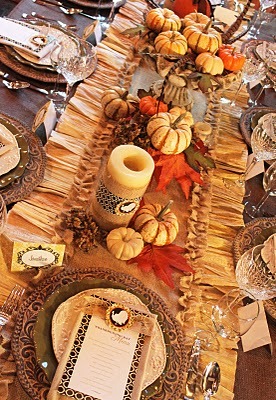 With such a long table, I am using two large urns and at each table with natural items in the middle of the table. 7. Last but not least, candles. I am a big fan of candles at the table. To create interest, I use different heights of candlesticks. 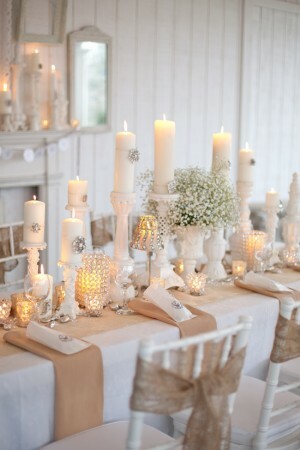 Then use many votives down the table to create the beautiful mood that can only come through candle light. Thanksgiving is an opportunity to take time to appreciate the people in your life. 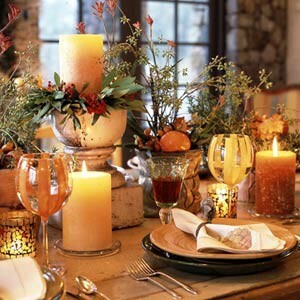 Setting a beautiful table sends the clearest message to your guests that they are important to you. My table sets the mood for the holiday and the weekend. This week, the guest rooms are getting the holiday once over. My nieces and nephew are staying with me so I am searching for small treasures to welcome them. Checking for guest towels, soaps and anything they may need during their stay. The rooms are getting a thorough last cleaning. I wish I could put a seal on each room but sadly, our cat likes to lay on every guest room bed. He likes to make everyone feel welcome too. I am also making chili, mashed potatoes and sausage balls for the weekend. Yesterday I ordered my leftover containers. Two elderly neighbors have been called to see if they have plans for the holiday and I will keep an eye out to make sure they go, if not, they will be sitting at my table. What a great post packed with helpful tips! Thanks for helping me get my Thanksgiving thoughts more organized!